DEARBORN — With more than 1.7 million people represented as of 2017, Wayne County is the largest in Michigan, and the man in charge of overseeing it all is Warren Evans. Evans was re-elected to the county’s top position in November and has used his platform to focus on a wide variety of tasks ranging from quality of life to diversity, infrastructure and more. He also got married in a small private ceremony to Renata Seals McCord of Detroit last year. Perhaps his biggest accomplishment during his time in office, however, has been in the financial arena. Evans has successfully spearheaded the county’s turnaround to a financial surplus after facing and eliminating a massive structural deficit of $52 million. An $82 million accumulated deficit was also eliminated, leading up to his election last year. Evans recounted his administration’s turnaround in an interview with The Arab American News Publisher Osama Siblani, which was posted on Facebook this past Thursday. The former Wayne County sheriff also looked outside the county for help in fixing its dire financial situation. Known as Oakland County’s financial wiz, Daddow helped Evans and his team gain a clear understanding of what needed to be done. “Detroit was just coming out of a bankruptcy (and) the main thing was I wanted to know just how bad it was so I could be honest with people about what to do to fix it,” Evans said. After the initial steps of getting a clear road map of the county’s financial challenges, Evans began putting his plan in motion. When asked by Siblani how the county was able to avoid bankruptcy, Evans discussed making difficult but necessary changes. “We had to reduce or modify pension plans, first of all,” he said. “We (also) had to modify health care, but with the idea that we were not taking anything away. It wasn’t easy, but it paid off in the end. “We knew there were some concessions to be made and that would save money to pay down the debt,” Evans said. Identifying which properties in the county were necessary and which could be sold also helped. Siblani also praised Evans for his hires, especially within the Arab American community, including Zenna Faraj Elhasan, a former Robert Ficano appointee and Wayne County general counsel. “Zenna was really critical (in leading the financial turnaround) because she was a carryover from the previous administration,” Evans said, calling her a “great lawyer” but more importantly a “great manager” of several different key projects. Other Arab Americans in the administration include Khalil Rahal, an assistant county executive under Evans who focuses on repurposing underused or vacant county-owned properties and structural issues, and Zeinab Hussein, Wayne County’s director of diversity and inclusion and constituent affairs. Attorney Nabih Ayad was also recently elected as the chairman of the Wayne County Airport Authority by his peers, a decision Evans said he would have made if he were on the board. 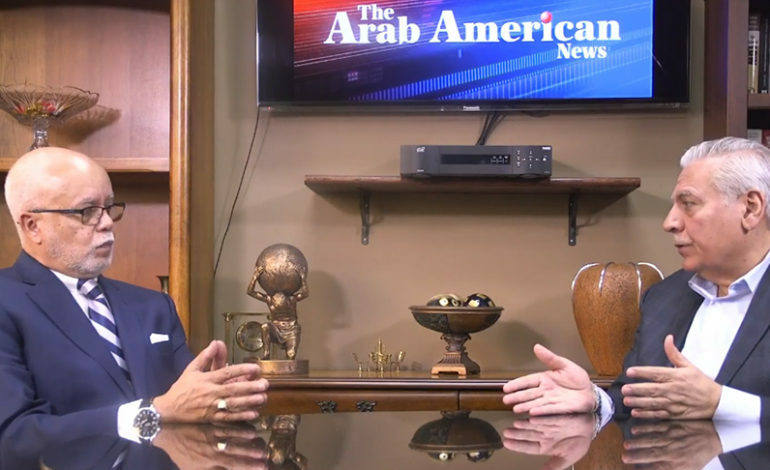 “I’m glad to have those members of the community there because I’m always looking for strong people with talent,” Evans said in the interview, which can be seen on The Arab Americans News Facebook page or below. A sit down with Wayne County Executive Warren Evans as he takes on a second term. Review of the past four years and looking ahead for the future. Episode 2- Part 2:A sit down with Wayne County Executive Warren Evans as he takes on a second term. Review of the past four years and looking ahead for the future.